I spent my Sunday morning, drying my stamps out. I have been keeping all these used stamps cut out from envelopes all over the world sending my ebay purchases. One interesting stamp from Singapore was this set. I only received one of the four and it intrigued me to know about the stamps. 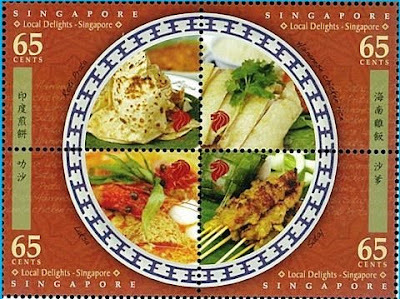 I found that particular stamp was one of 4 stamps of Singapore's local delight stamps. I also discovered that this stamp set was issued together with Macau. So there is also another set of Macau food and Macau stamp sets had two sets as well. Interesting. I guess the other reason why this stamp is interesting is that I am now on a diet. So even photos of food on stamps looked fantastically nice to me!